This building is part of the Kariya Iron Working Shop belonging to Toyoda Automatic Loom Works, Ltd. that was built in 1926 for the full-scale production of the Type G Automatic Loom. A section of the building was later moved to this site and restored. Consisting of a wooden truss structure with concrete walls, it is a valuable example of industrial architecture and displays the features of the period of transition from brick to reinforced concrete walls. 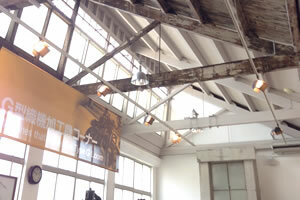 As well as manufacturing machinery from the founding period of Toyoda Automatic Loom Works, parts of the roof structure and exterior wall from the same period are on display.